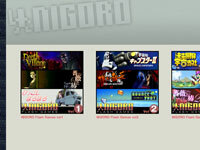 We distribute soundtracks of NiGORO games on Bandcamp. 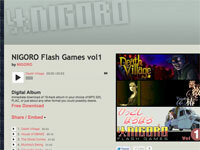 You can listen tracks on this site and link your favorite tracks and albums to your website. 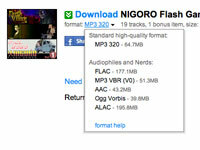 It is easy to browse despite Bandcamp is english site. Click on the album from the top page. And you can listen them by clicking on the play buttons at the beginning of names. 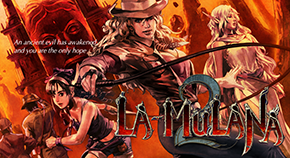 Download pages are shown by clicking on the links such as “Free Download” or “Download”. Clicking on a pop-up menu at rightof a word “format”, you can choose a format of files. 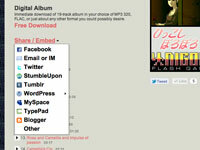 Clicking on a pop-up menu “Share / Embed” on pages of tracks, you can choose a player for many kinds of blogs. In the process, “1. Customize your player”, you can choose a type of player. In the process, “2. Copy / paste this code”, if you add the code is displayed in the text box to the source of the blog, you are finished.